Greetings Scapers! Welcome to the ASWG fan fiction pagee. There are currently 9 authors stories here. Feel free to browse around. A list of potential VS5 fiction titles. Addressed some story lines left hanging in the show such as the Nebari. 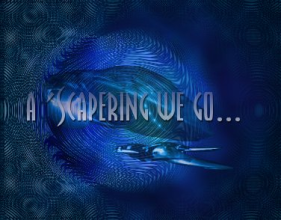 A Farscape filk of the Start Trek song Star Trekkin? Downtime on Moya written by a warped fan. legend while exploring a vast planet. John Crichton discovers he's out of one very basic necessity. Moya's crew must find work in order to buy supplies. Farscape Black Ghost takes place during season one's "The Flax" episode. It is about a sebeacean male who was a Peacekeeper, a former member of an elite Special Ops Unit called BLACK GHOSTS, who is now forced to hide as a bounty hunter. He is unknowingly thrown into the world of Farscape and eventually meets John, Aeryn, and the rest of the crew from Moya. Although none of the main characters appear in the story, there are several references made about them and the Farscape universe. AU. John Crichton as remembered by a future enemy. Not Part of AU Series. Aeryn shortly before and after the crew of Moya capture her. Post Mind the Baby. Crais ponders his situation. Chiana apologizes for smashing Aeryn's Prowler. No description. Spoilers for LATP 2. John & Aeryn Post Rhapsody in Blue scene. J&A Shippyness from a different perspective. John and Aeryn share a meal. John & Aeryn discuss Farscape 1. Watch out for the holian trill bats, they're vicious! The Farscraps #1 Series: This is a group of fics that I am posting even though they are unfinished and unlikely to be finished. All are rated PG-13 or less. #1: How Many Miles to Babylon? The Farscraps #2 Series: This is a group of fics that I am posting even though they are unfinished and unlikely to be finished. All are rated PG-13 or less. The Farscraps #3 Series: This is a group of fics that I am posting even though they are unfinished and unlikely to be finished. All are rated PG-13 or less. A moment in fragmented realities becomes what was. The Boys have to stop Crichton from making a Faustian deal. The crew must rescue a Leviathan to save themselves. All on Talyn is not as it seems. No summary. Would give away the story. D'Argo's thoughts after Aeryn 'dies'. Crichton has some explaining to do to the locals of a commerce planet. Humor. A bar room storyteller turns out to be more than expected by a young man searching for a legend. Crichton is resigned to his future. The crew is under attack. Series highlighting Aeryn Sun's life as a Peacekeeper. J&A or D&A scene during "Nerve". An alien's experiment proves disastrous for the crew but will an unexpected visitor give them a second chance? Aeryn Sun contemplates after joining the fugitives on Moya. Transporting aliens to a colony reveals a deadly secret. Crichton & Co. must deal with the effects of the Aurora Chair. Post Jeremiah Crichton thoughts. D'Argo's POV. Post Jeremiah Crichton thoughts. Aeryn's POV. Post Jeremiah Crichton thoughts. Zhaan's POV. Every Scarran has his day, every Charrid has his lunch, and Aeryn has her revenge. A more musical sort of revenge. Post DNA:MS journal entry in Crichton's log. The stories in the following section involve adult content that are for our mature readers only!